William Kurelek’s paintings of the traditional Christmas celebrations of his childhood provide a window back to his youth and to life on the Canadian prairies in a time when many immigrant communities were tightly knit groups dominated by one unifying faith. Hard-working people who often faced discrimination and hardships, they celebrated the traditions of their European past and made every effort to raise their families in a manner that carried on the teachings of their parents and grandparents. 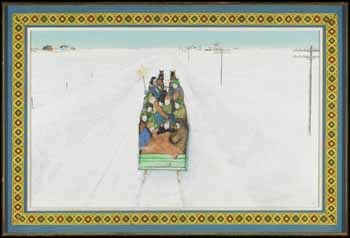 Kurelek painted several different depictions of Christmas carolers, and the subject clearly gave him joy as an adult. 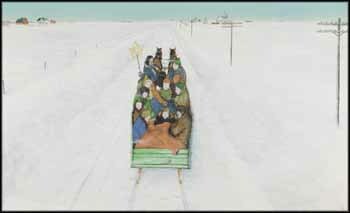 The perspective in the scene draws us into the work so that we feel we could be following the carolers down the snowy road, perhaps through the scenery of Kurelek’s childhood farm. Their bright clothing and the colours of the distant buildings contrast brilliantly with the snow, creating a joyful, engaging scene, which we cannot help but smile in response to. After a period of atheism and his eventual conversion from Ukrainian Orthodoxy to Roman Catholicism, Kurelek often placed symbols of his faith in his works, both overt and more subtle. The row of telephone poles might represent the Cross, an image that was such a strong symbol for him that he turned the letter W of his initialed signature into a cross in most of his mature works. Yet they also might be just what they are, a row of telephone poles, connecting a community together as does the activity of caroling on a cold Christmas in a Manitoba winter. At the end of his life Kurelek understood that joy that came from faith, any faith, could be universal, and in his works that return to the happy scenes of his childhood, he has come full circle.